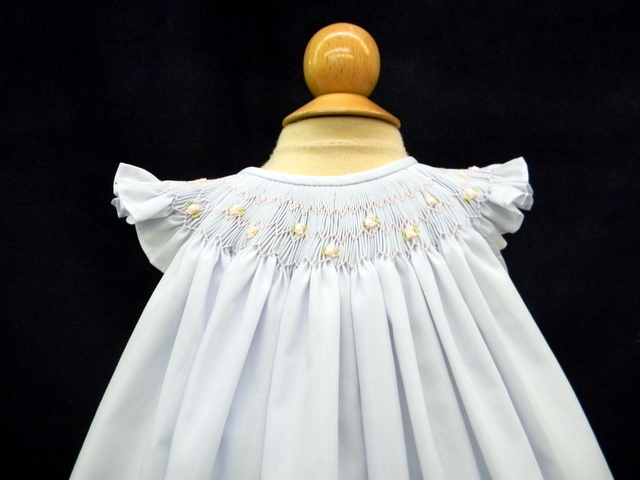 This beautiful little blue cotton blend dress is made by Will'beth, a leading designer of beautifully detailed children's clothing for more than 30 years. It features a bishop style yoke delicately embroidered with pink and white rosebuds, a simple round neckline and sweet angel wing sleeves. The full pintucked skirt has pink and white rosebuds embroidered above the hem. It closes in the back with three small buttons. Sizes new and has a matching diaper cover. 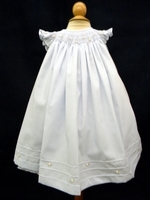 Perfect for your baby girl or toddler girl's wedding, portrait, or birthday outfit! This darling dress is also available in pink. See below. Size 3 months shoulder width=6½"
Size 9 months shoulder width=7"
Size 18 months shoulder width=8 ¾"